‘Act as If’ is a roadmap for people who feel lost in life or are searching for a new start but require some guidance in setting goals and staying zeroed-in on their objectives. 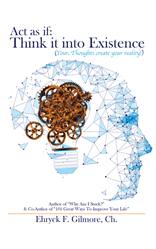 A certified hypnotherapist, life coach and intuitive counselor has released his powerful and inspiring guidebook to living one’s dreams, desires and goals that helps readers to navigate away from being reactive to life’s challenges and to instead become proactive and deliberate about living in a purposeful and passionate way. In “Act as If: Think It into Existence,” author Ehryck F. Gilmore, Ch., presents a fresh take on the Law of Attraction and encourages readers to not fall into the “fake it until you make it” mindset, but instead to “faith it” until they make it. Gilmore further explains that the easiest way to access the magic that’s already in one’s mind is to think of one’s thoughts as seeds that, with the right spiritual nourishment, can bring goals, desired assets and the lifestyle of one’s dreams to fruition. Focused on helping people to live with intention and manifest what they desire, “Act as If” teaches readers to go beyond belief, faith and what if’s and empowers them to take positive, decisive action in the now and, ultimately, foster a more meaningful and fulfilled life. By Ehryck F. Gilmore, Ch. Ehryck F. Gilmore, Ch., is a certified hypnotherapist, life coach, Reiki practitioner, empowerment coach and intuitive counselor. Gilmore has studied at the Omega Center in Rhinebeck, N.Y., and attended DePaul University, The Chicago School of Professional Psychology and the School of Spiritual Psychology in Milwaukee. He is a master practitioner of Neuro-Linguistic Programming and studied at the NLP Institute in Chicago. Gilmore is also the author of “Why Am I Stuck? (The Science of Releasing Yourself from Being Held A Mental Hostage)” and “The Law of Attraction 101: The Secret Power of Your Thoughts”. His consultancy and the “No Hidden Agendas” seminars have helped clients from coast to coast and beyond to achieve success on professional and personal levels through life coaching, national seminars and workshops. Gilmore currently resides in the Metropolitan Chicago area and is working on his next book, “If You Can Believe It You Can Achieve It: The Magic of Your Thoughts”. To learn more, please visit http://www.ehryck.com or connect with the author on Twitter and Facebook.